It’s festival season in Darwin again. Gallerists Matt Ward (Outstation Gallery) and Paul Johnstone (Paul Johnstone Gallery, formerly known as CCAE) have brought back the Salon des Refusés for a second season. What could be more festive? Reacting last year to the reduced size of the final hang for the National Aboriginal and Torres Strait Islander Art Awards, Ward and Johnstone elected to invite those who didn’t make the cut at NATSIAA to participate in their alternative celebration. The result was a sprightly collection of familiar masterpieces and intriguing new work, a total of 40 canvases, sculpture, and works on paper. For the 2014 edition of the Salon, Ward and Johnstone have increased their won hang by over 50%, with 64 works included the time. Seven bark paintings extend the scope of the selection as well, a welcome addition to the show’s diversity. All in all (although I obviously haven’t seen the roster of the NATSIAA at the time of this writing), the Salon looks to be a fair challenge, almost equal in size to the canonical show, and certain to be its equal in quality. 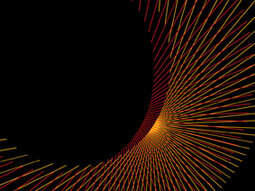 As is true of the NATSIAA, some artists are making an encore appearance. 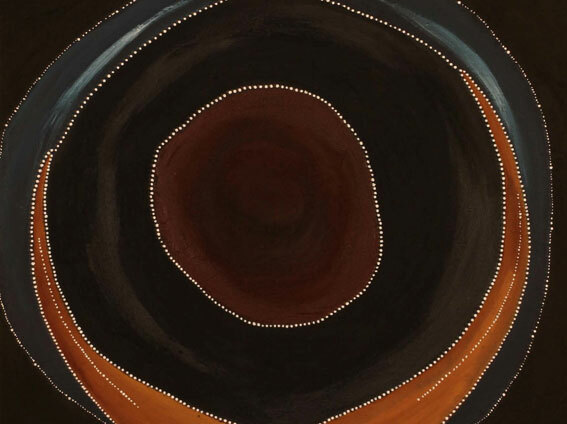 Repeaters from the first Salon this year include Sandy Brumby, Roy Burnyila, Nyarapayi Giles, Ishmael Marika, Yukultji Napangati, Eve Nargoodah, Rosie Tasman, and the Spinifex Women with another collaborative canvas. Last year’s overall winners at the NATSIAA, Jenni Kemarre Martinello, is represented in the Salon this time with another blown-glass work, an eel trap that brings to mind the seminal weaving work of Yvonne Koolmatrie. Among those revisiting the Salon, Sandy Brumby’s rough “Victory Downs” is one of the strongest works I’ve seen from this artist; and Roy Burnyila’s “Freshwater Story” is packed with energy. The ever-inventive Ishmael Marika scores a hit with his spooky but humorous digital photographic print “Galka with the Artworks.” A galka is a “dark heart person” and this particular one, with eyes straight out of “Children of the Damned,” has found his way into heart of the Buku-Larrnggay Mulka Centre and stands, wearing a bright red “Gove NT” t-shirt, amidst a forest of larrakitj ready for sale. As always, I have my favorites among the entries. Perhaps the stand-out for me is Mark Nodea’s “Lost Souls,” a stunning work from this Warmun artist in black, brown and bluish-gray ochres that recalls some of Rover Thomas’s masterpieces, infused in spirit with a bit of Dante’s Inferno, and executed with washes of great delicacy. I’ve always been impressed with Nodea’s command of color within a restricted palette, but he’s quite outdone himself this time. It’s terrestrial and celestial at the same time. Nancy McDinny’s history painting, “War at Blackfella Spring,” is a tour-de-force of allover composition whose clever use of color is an outstanding achievement. The painting depicts the incursion of dozens of policemen into a camp in the bush of the Barkley Tableland. In the foreground a few white humpies grouped around fire testify to the presence of blackfellas and are balanced in the composition by a screen of white clouds that stretches across the top edge of the canvas. In between, amidst the variegated greens of the forest land, blue-jacketed policemen spread out in search of the blackfellas. The policemen’s white hats create a visual bridge between the humpies and the clouds; scattered amongst them tiny white dots show the presence of blackfellas hidden in the bush, ready to defend their country against the invaders’ incursion. Color is key to Jayaku Biljabu’s “Wikirri” from Martumili Artists. Color also provides the strength in the design of “Warlutu” by Tjarlili Art’s Bob Gibson, with intense red, white, and blue swirling in the shape representing Lake Hopkins in Western Australia. Another strong work from Tjarlili in reds and blues is Valmayi Nampitjinpa’s “Karrkurunkintja,” a retelling of the wati kutjara and liru kutjara (two men and two snakes) story from the Kintore region. Tommy May uses a similar palette to quite different effect in his depiction of the “Seven Sisters” story from Wangkajungka country, courtesy of Mangkaja Arts; the composition in some ways recalls Lisa Uhl’s paintings of trees from a different country. And perhaps proving that the desert is indeed a country for old men, strong works from Harry Tjutjuna, Johnny Yungut Tjupurrula, and Roy Underwood bring a muscular strength to the painting section of the Salon. In the category of works on paper, Injalak Arts is well represented by two members of Waud Namok’s family. Grandson Maath Maralngurra’s “Lambalk” (sugar glider) is full of grace and movement, while granddaughter Lorraine Kabbindi White’s “Guardians” is full of female water spirits swirling above a lily-encrested Rainbow Serpent. The old man has surely left his tradition is good hands. From Yirrkala, Munuy’ngu Marika, one of the stars of the Yuta (new) screeprint collection that debuted at Garma in 2010, has contributed a charming new work, “Dhapirrk Girri,” a self-portrait in a flowing pink-and-green flowered print skirt on the beach near her home. The passing on of traditions finds a place in the barks section as well, with Antonia Pascoe contributing her version of “Fresh Water Mussels” (ngangi), a motif developed in Maningrida a decade ago by her father, Michael Gadjawala. Similarly, Fiona Mason carries on in the tradition of Tommy Gondorra Steele with a lovely and delicate rendering of the “Jima Jima (Waterlily)” motif. 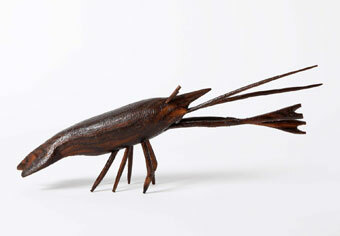 executed in carved blackwattle wood, that is simply breathtaking. The delicacy of the creature’s limbs, eyestalks, and feelers conveys a visceral sense of their movement, swaying in its watery habitat; the rounded bulk of its body, with marks of the workman’s rasp clearly visible, gleams with a polished light that seems the very refraction of light on the water. Not quite two feet long from its tip to its tail, it fairly delights the eye with grace and vigor. Once again, my hat is off to Ward and Johnstone for bringing together this extraordinary show. But I would be remiss not to mention Nicole Vandersteegen of Niva Design, who has produced the catalogue for this year’s exhibition. It’s a work of stunning design that enhances the beauty of the artworks themselves and provides (in PDF format) easy navigation through the selections. 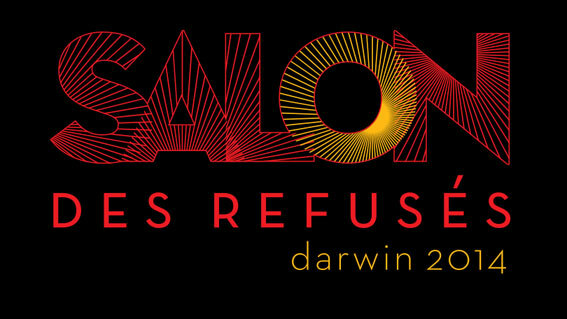 All around, the Salon des Refusés once more proves itself to be a class act, and I am sure that it will be a major draw during the Darwin Festival. The Salon will be showing 9-24 August on the Stokes Hill Wharf; don’t miss it when you’re in town. This entry was posted in Art and tagged Salon des Refusés. Bookmark the permalink. I went and visited the Salon des Refusés, and was very impressed by the quality of the works presented. And also impressed by the number of works that had been sold. This is a great success, and I hope to see it again next year.